We first went on a tractor ride to the petting zoo. This was Bruce's first time not being afraid to pet the animals. On our tractor ride back to the patch, we got to see a pumpkin being shot out of a cannon which was completely unexpected and amazing! Then we walked through the corn maze. Bruce fell asleep! 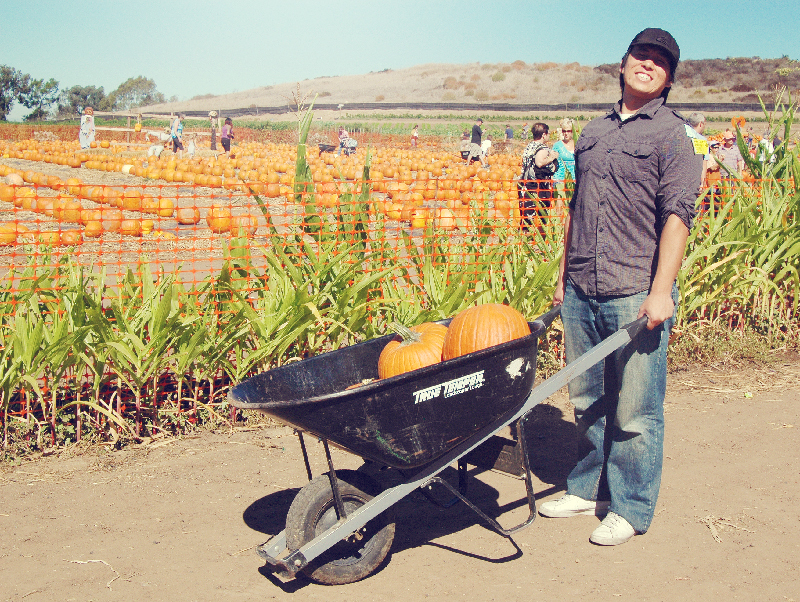 :) I'm glad Kaori told us to take a picture with the pumpkins before we did all the other activities. We took a few silly pictures in between finding our pumpkins. While taking this photo, I thought my head got stuck so I freaked out. Haha, that's what I get for sticking it out so far and for having a big head! Tanaka Farms was amazing! :) We all had so much fun! I'm now wanting to go back to pick our own veggies when Bruce is old enough to understand where vegetables come from. Thank you for the recommendations, friends! I'll be back with a post on what we did with our pumpkins later today.